(CBS News) Ask and you shall receive! 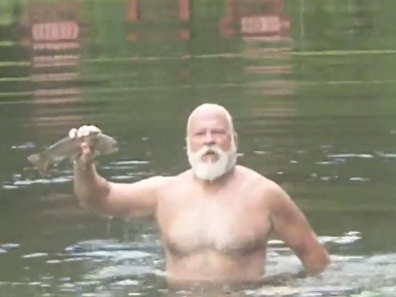 When a woman goes out looking for her burly "mountain man" (and semi-Santa Claus looking) husband, she requests fish for dinner. What kind of fish you ask? Rainbow trout to be exact. So her underwear-clad hubby promptly dives into the lake and fetches her one with his bare hands, asking "Will this do?" And it shall! Check out the YouTube video above posted by Douglas Owen bringing home the definition of fresh fish for dinner. Kind of makes that so-called "fresh fish" from Whole Foods look pretty stale, doesn't it? Me guesses that this was a pre-stocked lake, and yes, this particular trout wasn't the biggest fighter, but who cares, it's still pretty darn impressive. And don't click off too fast, or you'll miss the hysterical disclaimer at the end that reads, "Please remenber [their spelling not mine] the camera adds 40 - 50 pounds," referring to Doug's hefty bowl full of jelly belly. But hey, if he can catch dinner on demand like that, I'll take a little beer gut any day.